Sam Vokes made his professional debut alongside the man responsible for bringing him to Turf Moor - but he won’t be looking to do Eddie Howe any favours on the final day of the season. The Wales international made his debut for AFC Bournemouth as a 17-year-old, partnering Brett Pitman up front in a 2-0 victory over Nottingham Forest at Dean Court in League One. 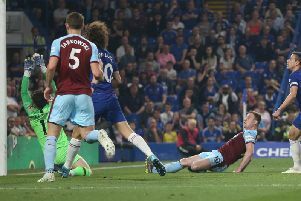 The Cherries had Howe playing at right back that day while Clarets midfielder Jack Cork also featured for the hosts, during his first ever loan spell from Chelsea. A knee injury forced Sean Dyche’s predecessor to hang up his boots that season and, after spells working under Kevin Bond and Jimmy Quinn, he moved in to a full-time managerial role. At Burnley he took Vokes on loan from Wolves during the 2011/12 campaign in the Championship before making the striker’s move permanent that summer. Vokes, who made 21 appearances for Howe, scoring twice, netted against his former boss in last season’s loss on the south coast but he’s hoping to sign off on a high this time round. “It’s been a fantastic season and being at home it’s a chance to end the season on a high and finish with a celebration in front of the home fans,” he said. “It’s been a huge season for us and to secure seventh position is amazing for a club like this. Over the years we’ve had promotions and survivals and we’ve capped that with seventh place now which is amazing. “It’s a big game for us with it being at the Turf. Bournemouth are another team that have done well over the years. “It’s good to see that they’ve survived again for another year. It’ll will be a nice celebration for us to end the season on a high by beating them. “It’s more than 10 years ago now since I made my debut there. I played alongside Eddie Howe that day on my debut. “It was a long time ago but it was great to go through a club like that, a local side for myself, and to see them where they are now in the Premier League is great. Vokes could never have envisaged the Clarets in this position when he put pen to paper little under six years ago. But the 28-year-old, who has scored 60 times for the club, can now look forward to a Europa League campaign, with the draw for the second qualifying round made in Nyon next month. He said: “It’s brilliant and something we’re all looking forward to because many of us haven’t been involved in it. It’s a great chance for us to play football at that level. “I couldn’t see this at all, going back to the Championship years. You’d never dream of going on to the Europa League. For us it’s been a great journey and one that we want to continue.